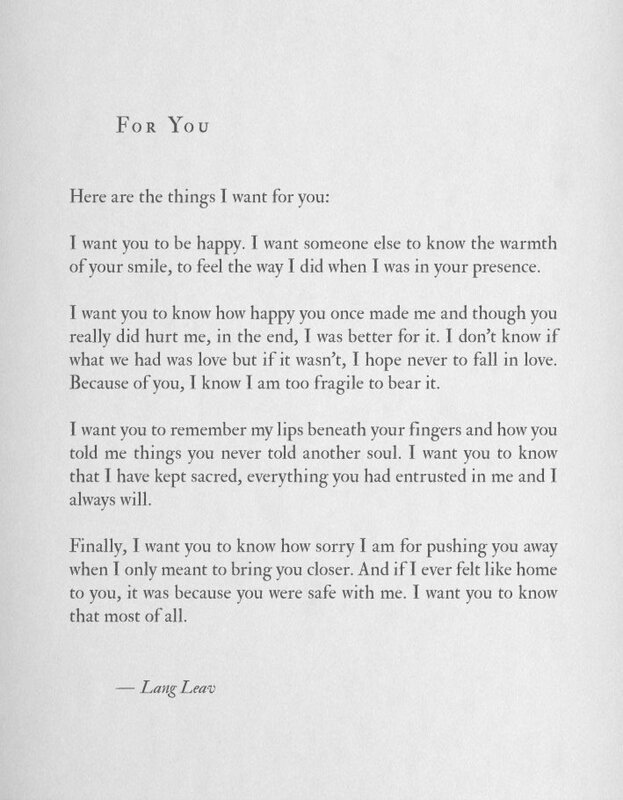 The first time I read this book by Lang Leav, it was feverishly. When I reached the last page, I felt a little dizzy, overwhelmed, almost disoriented. It was as though someone had sunk a hook deep inside of me and fished out all of the feelings I have been eating, and proceeded to weave them into sentences and verses that held coherence. Unlike many of the digested feelings. At first sight, one may mistake this as a collection of love poems or poems written to past lovers. But for me it reads as the internal ebbs and flows of a person throughout many different kinds of relationships; from unrequited love to crushes, to the end of a love. This is a collection of poems written to herself and for herself, in order to understand what lies at her very core. 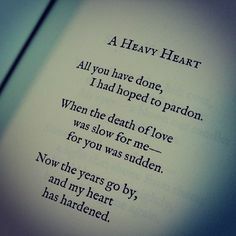 Even the poems addressed to another. The beauty of Leav’s collection is that I don’t feel the need to uncover the details of these stories. The feelings evoked are enough. 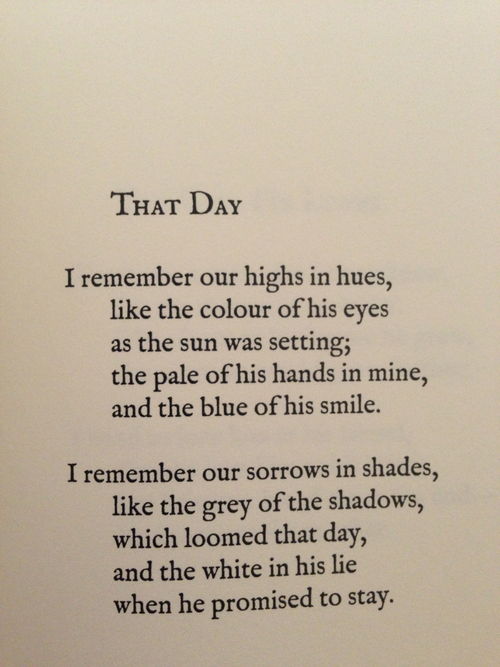 I’ve now read many of these poems again and again. Some make me smile, some make me pensive. Others fill up my heart with warmth. Some break my heart, while silent tears slip out. The real credit to Leav is that all of them make me feel something. Even if it is just that feeling you get from knowing that someone has managed to articulate the stream of torrential, internal babble that you have been carrying around. And that’s no small thing. Leav’s work is a masterful revelation to me. The following piece, though not from this book, is my favourite. It is touching and heartbreaking. It stills me. Find out more about Lang Leav here. 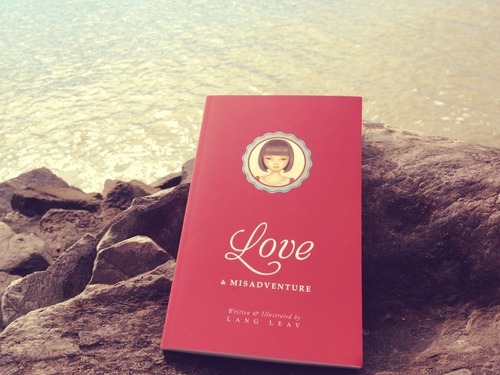 And definitely get yourself a copy of Love & Misadventure. It’s the book that becomes your diary, your best friend, your blankie. At the most recent exhibition opening I attended at Mori gallery, I was simply jarred in awe. It’s been quite some time since I’ve seen art that has moved me beyond, “oh, that’s clever/pretty!” or just “ooooh!” (and then forgetting about it quite swiftly within the next few days). 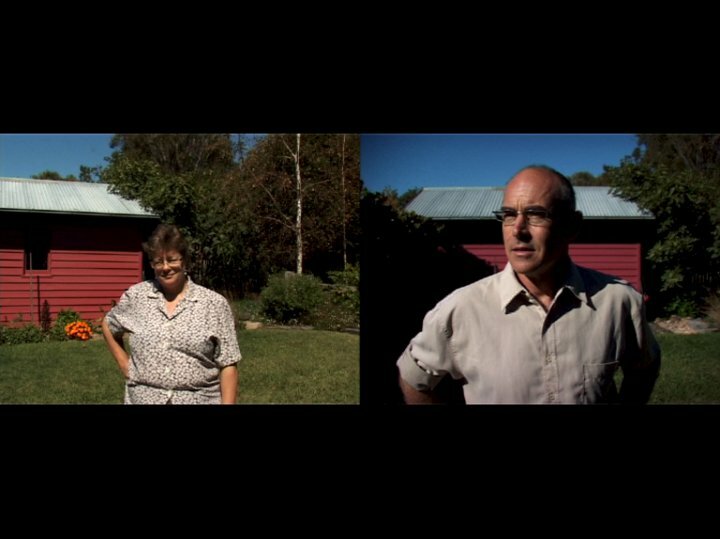 Nearly two weeks on, the work of one Hayley Rose Hill is still as fresh in my mind as if I were standing in front of the triple screen projection that is, Photographs of two people who could do anything with their lives (2010). An arresting translation of mediums, from photography to video, and back to photography again; it is a work that must be experienced before you can even begin to grasp its poignant agency. In most (art) circles, it’s hinted that explorations of ideas such as ‘memory’, ‘identity’ and ‘the self’ in contemporary art practice are the equivalent of milk that smells a bit funky; a bit past their use-by dates perhaps. So it certainly speaks volumes about Hill’s insight, in that she’s able to not only explore the subject matter of past, present and future selves with fresh eyes, but to concurrently critique the nature of photography itself as being an instrument of self-reflection and maybe even self-maintenance. In the back room of the gallery, a quaint television plays Two Young Men on the Threshold of Great Achievement (2009). Equally breathtaking and thought-provoking, this video expresses great hopes, massive failures and the potential for success. The two young men featured are well cast in their roles as underdogs and conduits of possibility; keepers of the secret to self-actualisation. 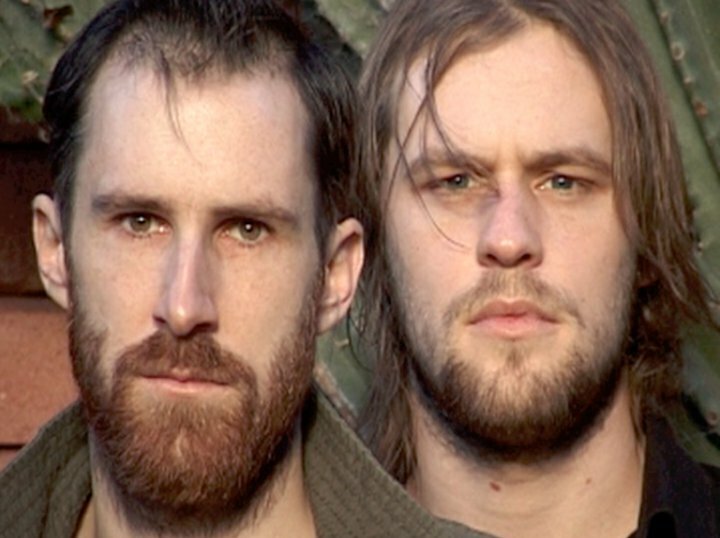 An exhibition of video work not to be missed. Make sure Mori Gallery is worked into your schedule within the next two weeks. You won’t be sorry, but you may be moved beyond words. As many of my friends can attest to, my love for cooking has gone into overdrive this year, especially as the cutting breezes and gloomy downpours of winter have set in. So I guess it was only a matter of time until I could no longer put off watching the movie Julie & Julia. I’ve always been a firm believer in reading the book before watching the movie… but I made an exception to the rule today. It’ll be interesting to do it the other way around for once I guess. Where to begin? I adore Amy Adams. She has a way of portraying emotionally driven characters (ones that I might otherwise have found to be annoying) in a very real, fragile and relate-able way. Watching her, I felt like I AM Julie Powell, and Julie Powell is me. (Of course this is a credit to many other people, namely, writer, director etc.) That feeling of being without direction and questioning, ‘what is it that I’m supposed to do with myself?’ or even ‘what is it that I would truly LOVE doing all the time?’… are there many people out there feeling that way too? It felt like it was just me. It makes me wonder though, whether it’s not just the flighty Gen-Y characteristic that’s the cause of this melancholia of feeling lost. How sweet it would be to solve all of that by consistently cooking and blogging for 365 days. And how delicious it would be to feel supported in doing just that. I fell in love with both Julie & Julia’s husbands. Saint or not, I’d think everyone would want someone like that in their lives … someone who stands by you and validates what you’re doing, no matter how strange or silly or even utterly pointless it may seem to anyone else. That’s all anyone wants on some basic level isn’t it? Not necessarily a lover, partner or spouse to who you could say “You are the butter to my bread, the breath to my life”, but just someone to guide you through the dark tunnels and hold your hand as you step into the light. Julia Childs may have been Julie’s hero… but Julie Powell, you are mine. You’re flawed and vulnerable, and you saved yourself. For many consecutive moments, you made me feel like I could do that too. 524 recipes in 365 days. …. Well not quite that, but more like I can find my own 524 recipes in 365 days challenge! Thank you, Julie & Julia. Bon Appetit!